As Rani drops the dark yellow pieces of turmeric root into the grinding machine, the production room quickly fills with a strong curry-like smell. For her and the handful of other women packing and labeling bags of spices, this is the sweet - or rather spicy - smell of success. 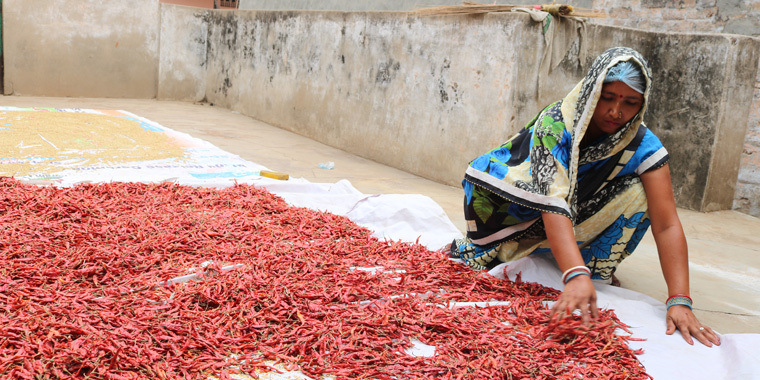 Together, with the support of SOS Children’s Villages of India, these women from the village of Tilak Nagar, on the outskirts of Delhi, have started their own spice production business. Stacked on a shelf is the current inventory: small bags of ground turmeric, cumin, kasoori methi, coriander and hot pepper – all staples of Indian cooking. “We think there’s a good market for selling our spices in nearby shops and markets,” says Rani, 30, a mother of three, wearing a colourful yellow veil around her face as she does the grinding. The women – 12 in all – started the business in mid-March and they hope that with some more marketing they can eventually increase their output and the variety of spices they sell. “We are not seeing much profit yet, but I’m sure we will soon,” Rani adds. Supporting women to start their own businesses is one way SOS Children’s Villages of India has been helping more than 60 families - with a total of 200 children - in this poor community where the 6,500 residents are essentially cut off from any basic government or social services. SOS Children’s Villages of India – which is the only organization serving this community – chose to work with those families that had the most children and were struggling to make ends meet. As a way to increase the family income, SOS Children’s Villages of India organized the women into self-help groups, each of which have access to a bank account with 75% of the funds coming from SOS India and 25% from their own pockets. The women can borrow from the account individually to start their own business or join together to do something entrepreneurial, like starting the spice business. “We have a special objective of empowering women, because we feel if the women are empowered then the whole family is empowered, the whole society is empowered,” says Niharika Chamola, Assistant Village Director at SOS Children’s Village Greenfield, from which the program is run. “If the mother is empowered she can bring up the children and support the family in a much better way,” she explains. SOS Children’s Villages of India supports the women through various trainings and helps them get their ideas off the ground. In the case of the spice business, SOS staff connected the women with other spice operators as part of their training, as well as supported them in getting the necessary certification and developing a business plan. With Rani acting as an overall manager, the women have divided the work among themselves, from grinding and packing to marketing and selling. If all goes well, after six months they will qualify for government loans to expand. For Rani, being part of the SOS program for the past two years has made a big difference for her and her family. It allowed her to first start a small sewing business that increased her income from 750 Indian rupees per month to 7,000, or about €85. Now she’s hoping the spice business can further help her and the other women. “Like our parents, we are living in poverty,” says Rani later at her home. “We want our children to have better chances in life, to be better educated.” And her children have big dreams: a doctor, a police officer and army officer, they say with enthusiasm.